I'm feeling Giddy today. And when I feel giddy, I like to look at work by Steppie! 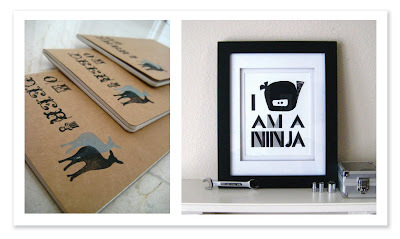 Without missing a beat, Steppie is consistently churning out simple yet amusing hand-stamped designs. May I suggest a journal or art print to brighten your day? See all of Steppie wares in the Etsy shop, and follow the Steppie blog, too! thank you so much for featuring me! i am super flattered! :) and i must say, i love the feel of your blog. very clean + fresh!